Lost: 27 Feb,1942 (Lt. Cdr. N. V. J. T. Thew, RN. )(c 6-45’S, 112-00E) sunk by—mines, Dutch was sailing near the northern coast of Java in the beginning of the evening of the 27 February, just before the beginning of the final stage of the battle of the Java Sea, when she was struck by a violent explosion. At the time they thought that she had been torpedoed by Japanese forces. Later it was found that she had struck a mine in a Dutch minefield. There where no Japanese forces in striking distance at the time of the explosion. 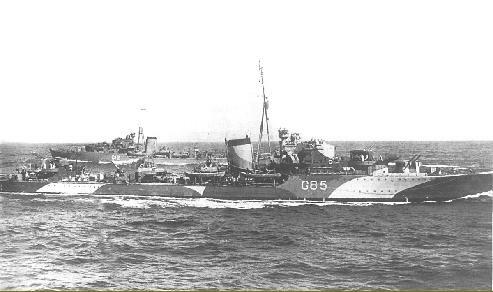 HMS Jupiter along with other destroyers sailed from Immingham on a minelaying mission off the Dutch coast. The minelayers were from the 20th Destroyer Flotilla and consisted of the minelaying-destroyers HMS Express, HMS Esk, HMS Icarus, HMS Intrepid and HMS Ivanhoe. The minelayers were escorted by the 5th Destroyer Flotilla consisted of the destroyers HMS Kelvin, HMS Jupiter and HMS Vortigern. Aireal reconnaissance detected a German force and the ships of the 20th and 5th DF were ordered to intercept, beliving wrongly that the German ships were part of an invasion force. HMS Express struck a mine and was badly damaged, HMS Esk went to her assistance and hit mine and sank immediately, HMS Ivanhoe also went to her assistance and hit a mine and was badly damaged, so much so she she had to be sunk by HMS Kelvin. HMS Express was towed back to Hull and took 13 months to repair. On 1 September 1940 HMS Jupiter, HMS Kelvin and HMS Vortigern joined the light cruisers HMS Aurora and HMS Galatea who were supporting the minelaying mission and when returning to base HMS Galatea struck another mine and was slightly damaged off Cleaner Shoal Buoy near the Humber light vessel. 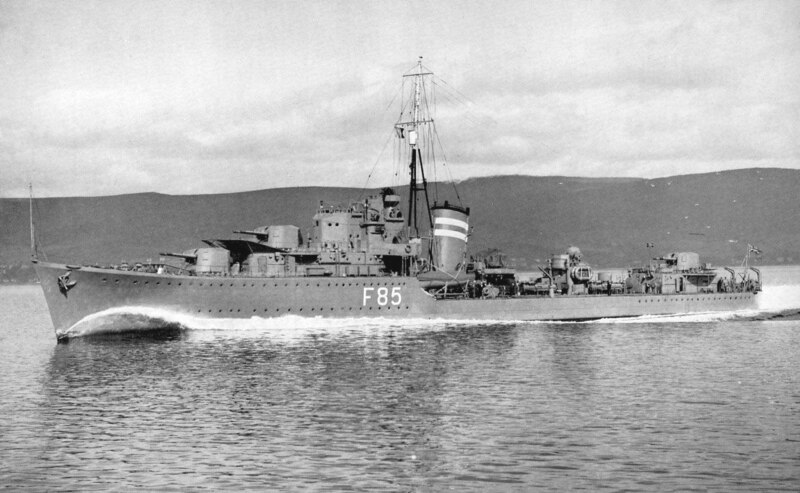 Force H (Vice Admiral Somerville) left Gibraltar on 6 February 1941. The battle-cruiser HMS Renown, battleship HMS Malaya, aircraft carrier HMS Ark Royal, light cruiser HMS Sheffield and the destroyers HMS Fearless, HMS Foxhound, HMS Foresight, HMS Fury, HMS Encounter and HMS Jersey left Gibraltar to the west with convoy HG-53. This was done to fool German and Italian observers in Spain. In the meantime 4 destroyers HMS Duncan, HMS Isis, HMS Firedrake and HMS Jupiter left Gibraltar and steamed to the east to conduct a anti-submarine sweep. During the night Force H reversed course and passed Gibraltar on a westerly course back into the Mediterranean. There they were joined by the 4 destroyers that conducted the anti-submarine sweep. On 8 February the Italian fleet left port and steamed south after they received reports of British carrier aircraft south of the Balearen. The Italians thought that there was another convoy to Malta. Early in the morning of 9 February Renown, Malaya and Sheffield bombarded the Italian city of Genua. In the harbour 4 ships were sunk and 18 were damaged. Also the city itself was damaged.